The creative juices were flowing the other night. (Yeah, I'm not sure how that happened either:). But wait, here is what they came up with--a cactus. I know! I'm not sure why, but I thought I should try to make a cactus. I'm thinking it was because I had cleaned my son's room, in which he has a cactus plant--he loves them. Then for some reason or other, one thing led to another and here we are. I actually came up with two different cactus ideas. The first idea is very simple and non-complex. As you know cacti can come in many shapes. My sons are more of those oblong type shapes, so that's the way I went. You may make any shape you like. Cut a cactus shape out of the green paper and glue it to the background. Since most cacti grow in hot places with sandy earth, I decided to add some sand at the bottom. Spread some glue all over, sprinkle the glue with sand, then shake off the excess. The final part is the pricklies--yes, I am a nursery school teacher. But, being the good teacher I am I did look up the real word for the pricklies which are called spines. To make the spines you will need some paint and a fork. I used green paint because it is what I had readily available, but feel free to use any color you would like. Pour the paint onto a flat surface, like a small paper plate. Dip the fork into the paint and then press on the cactus. 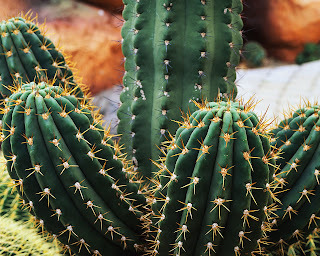 Cover the whole cactus with the spines. You have created a wonderful arid plant. The second cactus I created is a bit more involved and has more dimension. I made this cactus a little more like a plant you showcase in your home. First I cut out the shape of a pot and cactus from the cardboard. I then covered the cardboard with construction paper. If you would like you can always paint these too, and add decorative touches to the pot. After the pieces were covered, I used the tacky to glue the cactus to the back of the pot. I then put lines of tacky around the cactus. On these lines I laid toothpicks for the spines. For added affect, I made an Old Man Cactus. I saw this at a local nursery a few years ago, and it struck my fancy. This cactus looks just like a regular cactus, but is covered with a substance that looks like white hair. For this I stretched out a piece of cotton and hooked it to the the toothpick spines. Have fun, but watch those fingers. Both of these ideas are great -- thanks! Cute. Clay would be fun as well and easy to put the toothpicks in-would work well for a diorama. I like how you used the sand for a more sensory experience with art. That is SOOOO creative, I love this! Thanks so much, I'll be linking. Wonderful. Love the fork tine design, and the swirly white stuff on the cactus. They are very texturally realistic!! Thanks for the idea. I am linking this to my fellow preschool coworkers. Thanks!